The Wide, Wide World Digital Edition maps transatlantic publication networks via the development of a digital edition of Susan Warner’s 1851 female Bildungsroman The Wide, Wide World. The site is a work in progress. We are experimenting with the best methods for textual comparison as we add new content. Feel free to explore, but be patient with us. You may also want to visit our blog for information about our progress and visit the original version of the project. You can also download the e-book for the first edition of the novel. 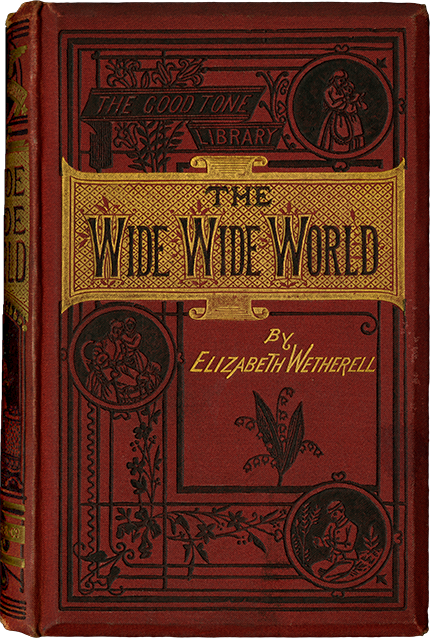 The Wide, Wide World was a transatlantic success that was steadily reprinted for over one hundred years. We bring together, for the first time, the textual and visual variants from 174 reprints of this unstable text to demonstrate how its cultural function and significance shifted with each locale and material reproduction. Although sentimentalism, broadly defined as the power of feelings to serve as a guide to moral conduct, was first understood as a relatively circumscribed phenomenon, chiefly manifest through popular novels written and read by women, its extensive reach across nineteenth-century culture is now widely recognized. Only recently have scholars begun to examine the sentimental novel’s interactions in an expansive transatlantic marketplace. This edition challenges assumptions about the gendered and national boundaries of sentimentality through an exploration of the reprinting and the reception of Warner’s novel.